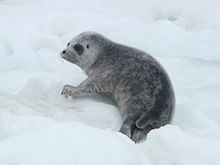 The ringed seal (Pusa hispida), also known as the jar seal and as netsik or nattiq by the Inuit, is an earless seal. They live in the Arctic and sub-Arctic areas. The ringed seal is a small seal. They are rarely greater than 1.5 m in length. They have a distinctive patterning of dark spots surrounded by light grey rings. It is the most abundant and wide-ranging ice seal in the northern hemisphere. The live throughout the Arctic Ocean, into the Bering Sea and Okhotsk Sea as far south as the northern coast of Japan in the Pacific, and throughout the North Atlantic coasts of Greenland and Scandinavia as far south as Newfoundland, and include two freshwater subspecies in northern Europe. Ringed seals are one of the main prey of polar bears. They have long been a part of the diet of indigenous people of the Arctic. The ringed seal is the smallest and most common seal in the Arctic. They have a small head, short cat-like snout, and a plump body. Their coat is dark with silver rings on their back and sides with a silver belly. Depending on subspecies and condition, adult size can range from 100 to 175 cm (40-69 in) and weigh from 32 to 140 kg (70-308 lbs). The seal averages about 5 ft (1.5 m) long with a weight of about 50–70 kg (110-150 lbs). Their small front flippers have claws more than 1 inch (2.5 cm) thick that are used to make breathing holes through 6.5 ft (2 m) thick ice. Ringed seals live throughout the Arctic Ocean. They can be found in the Baltic Sea, the Bering Sea and the Hudson Bay. They like to rest on ice floe and will move farther north for denser ice. One subspecies can be found in freshwater. Females reach sexual maturity at 4 years. Males do not reach maturity until 7 years old. During the spring breeding season, females make lairs in the thick ice and give birth in these structures. Females give birth to a single pup in March or April after a 9 month gestation period. Pups are weaned after one month. They build up a thick layer of blubber. Females usually begin mating in late April. Males will roam the ice for a mate. When found, the male and female may spend several days together before mating. Then the male looks for another mate. Ringed seals live about 25 to 30 years. They are solitary animals. They separate themselves from each other by hundreds of yards. Ringed seals eat a wide variety of small prey. They eat 72 species of fish and invertebrates. Their prey of choice includes mysids, shrimp, arctic cod, and herring. While feeding, ringed seals dive to depths of 35 to 150 ft (10–45 m). In the summer ringed seals feed along edge of the sea-ice for polar cod. In shallow water they feed on smaller cod. Ringed seals may also eat herring, smelt, whitefish, sculpin, perch, and crustaceans. Ringed seal are an important food item in particular for polar bears. During the pupping season, arctic fox and glaucous gulls take ringed seal pups born outside lairs. Killer whales, Greenland sharks and occasionally Atlantic walruses prey upon them in the water. This article has public domain work of the United States Government from references. ↑ Miyazaki, Nobuyuki (2009). "Ringed, Caspian and Baikal Seals". In Perrin, William F.; Wursig, Bernd; Thewissen, J. G. M. (eds.). Encyclopedia of Marine Mammals (2 ed.). 30 Corporate Drive, Burlington Ma. 01803: Academic Press. pp. 1033–1036. ISBN 978-0-12-373553-9. ↑ 4.0 4.1 4.2 4.3 4.4 4.5 4.6 4.7 4.8 Office of Protected Resources - NOAA Fisheries. "Ringed Seal (Phoca hispida)". accessed 11 March 2010. ↑ Bjørn A. Krafft, Kit M. Kovacs, Anne Kirstine Frie, Tore Haug and Christian Lydersen (2006). "Growth and population parameters of ringed seals (Pusa hispida) from Svalbard, Norway, 2002–2004". ICES Journal of Marine Science 63 (6): 1136–1144. doi:10.1016/j.icesjms.2006.04.001. Wikimedia Commons has media related to Pusa hispida. This page was last changed on 29 November 2018, at 09:41.